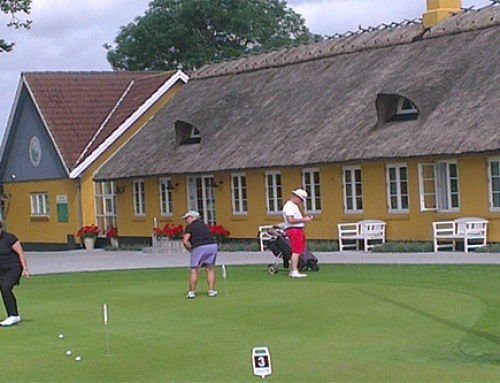 Halsted Kloster Golfclub, opened their 18-hole course in June, 1996. The club is only 10 min. drive from Hotel Lolland. The 200 year old Forest manager house, sets the frame for the social life of the club. From here there is a great view of the putting-green and some of the first holes of the course. The course is beautifully situatied in the area around Halsted Cloister and along Halsted creek the first 9 holes curve around small forests and water hazards. Holes 10 -17 are situated on a ridge along a protected marsh area and here the terrain is the real challenge. Hole 18 is narrow and tricky and follows the old Kastanjeallé (Chestnuttree avenue) back to the club house. We found this video on their website. Take a look.